Topping a tiki hut, or outdoor patio area with a thatch roof creates a cool, shady oasis with a tropical, natural vibe. Because natural thatch is a sustainable, environmentally friendly and cost-effective material, a thatch roof is ideal for commercial and residential projects of all sizes. However, like any other roofing material, natural thatch eventually wears out. Sometimes, a repair is all that is necessary to extend the life of your roof. 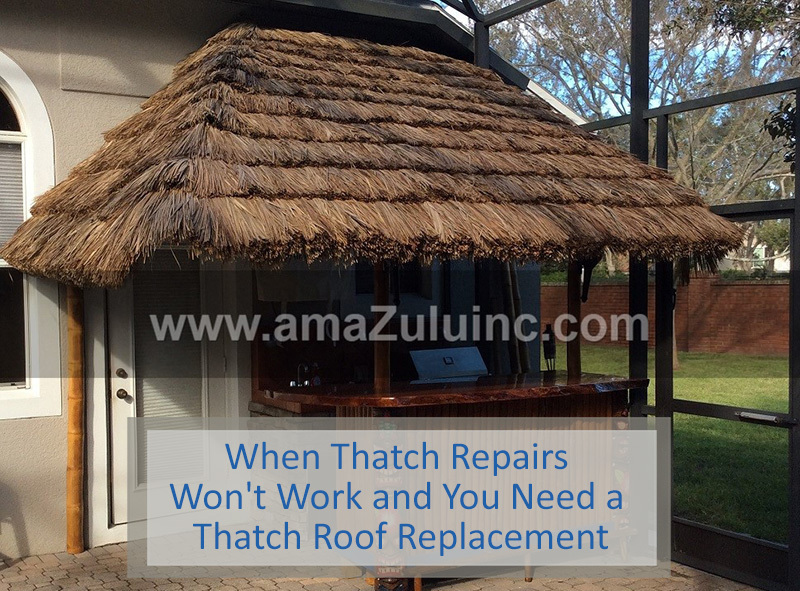 However, when a thatch repair won’t work, it’s best to opt for a thatch roof replacement. Here are a few ways to see if you need a full thatch roof replacement. How long will thatch roofing last? That depends. The type and quality of the roof thatch utilized and the installation of the original thatch roof are significant factors in a roof’s lifespan. The destructive forces the roof has to endure also impact its longevity. Heavy rains, strong winds, and high humidity can all cause trouble. Mold and birds can also cause damage that may speed a thatch roof’s demise. While the lifespan of your roof depends on your unique situation and location, you can generally expect a properly installed thatch roof to last for several years. If you are in a drier climate, you can add a few more years to the lifespan of your natural thatch roof. Trying to decide whether to repair the existing thatch roof or entertain a thatch roof replacement can be tricky. Is the roof relatively new and simply looking tired? Are the problems small, isolated and mostly aesthetic? If so, thatch repairs can likely extend the life of your roof. However, is the roof is reaching the end of its expected lifespan? Are the problems severe or widespread? Is the material starting to deteriorate? If so, talking to a professional about a thatch roof replacement is the best choice. Mexican Thatch Rain Cape comes in sheets and is perfect for layering. These thatch panels are available in sheets that are 42” x 42” x 1/8”. The Mexican Rain Capes are round and are sold in 9’ and 12’ in diameter. They are perfect for indoors or outdoors. Tahiti Thatch is an appealingly shaggy palm thatch. This sturdy product is 98 percent waterproof. It’s ideal for creating a rustic look. Thahiti Thatch is available in 23” to 24” long by 37” wide. Each Tahiti thatch panel is 2” thick. Thatch reed panels are crafted from African thatch. These panels feature neat, clean lines. The result is a naturally refined appearance whether they’re used inside or outside. Thatch reed panels are available in 31” x 16” x 1.5. Each panel covers 2.5 square feet. 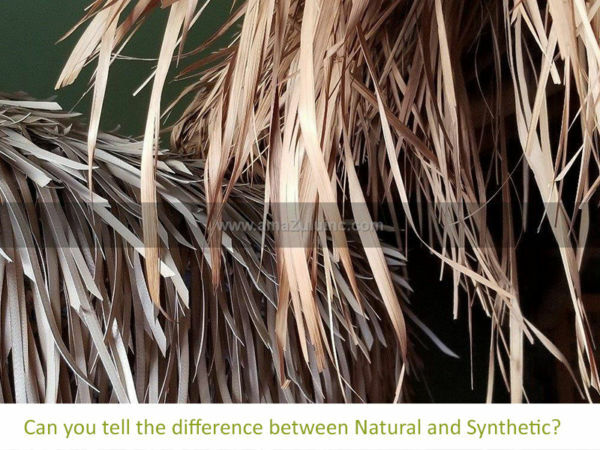 Synthetic Thatch Roofing If you’d like to explore a longer lifespan of your thatch roof without sacrificing the beauty and authenticity, please take a look at our synthetic thatch roofing line of products. They are designed to mimic the appearance of thatch. With its increased resistance to humidity and decay, it provides a natural look and a longer lifespan. amaZulu carries seven types of synthetic thatch roofing products to get the look you desire. 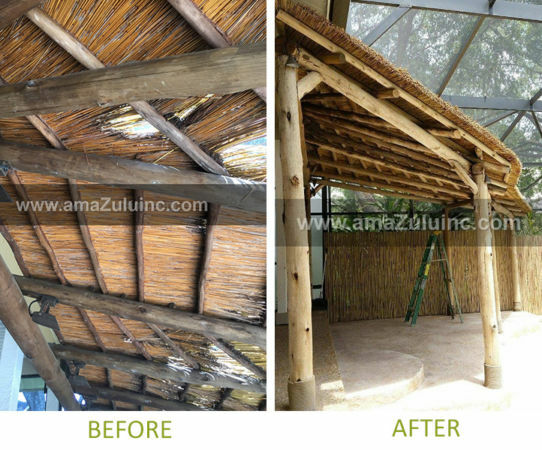 When you want construction-grade thatch products that are safe, sturdy and sustainable, count on amaZulu. For more than 15 years, we’ve been importing high-quality, environmentally friendly thatch roofing materials from around the world for use in luxury resorts, theme parks, zoos, restaurants and residential projects. Our expert team will be delighted to help you explore the possibilities and select the best option for your thatch roof replacement. Contact us today at 877-243-5309 to help you find the best-thatched roofing materials for your project.